Brand New ocean view villa with a beautiful bay view and a 7 minute walk to Dominicalito beach. You can hear the ocean from this mountain-side villa and enjoy the breeze from aloft! The Costa Rican wildlife is abundant, especially in the morning when the birds are singing. It is not uncommon to spot a tucan or other wildlife while sitting under the palapa next to your private pool. Each bedroom (located on the lower level) has a queen size bed , a balcony and it's own bathroom with his/her sinks (one bathroom has a shower/tub and the other just a shower). The laundry room and a small living area is also on the lower level. The upper level consists of the kitchen, dining/living area and half bath...and don't forget the views, views, views! The wrap-around balcony and patio (complete with pool) is right outside the sliding doors on the upper level. Maid service is once a week and included with your stay. Also, if you are renting a vehicle, it is advised that you rent a 4WD. The villa sits on a steep hill and most of the roads off the main highway are unpaved. Therefore, a 4WD would be best. We are a busy family with four kids. We live in a Northwest suburb of Chicago. My husband and I work in property management for our family company. We are very proud of all of our properties but this one is our 'baby'. Of course, the kids love it, too! We bought it as an investment property and hope to use it as our second home some day. We vacation there when we can with the kids or without. We hope to make many memories at our little Villa Vista Encantada(villa with the enchanted view)! We chose Dominical after looking into Mexico, Belize and down the Pacific Coast of Costa Rica because of the 'surf' town and affordability. It really reminded me of Lahaina, Maui 30 years ago. It is very 'untouched'. You won't find a McDonald's in Dominical...at least not yet. You can walk to Dominicalito beach in about 7 minutes and also explore the area and walk to one of the local 'swimming pools'(it's a small waterfall/pool nearby). Our management company, Costa del Sol, is located right down the road from Canto del Mar. Dave or Deb will be happy to make your reservation\ and can also help with rental cars, excursions, and tours. We love to wake up to our wonderful view and hang out on the patio in the morning. We have our coffee and watch the birds while the younger ones swim. We eat breakfast at the villa or in town and usually discuss what we are going to do for the day. Some of our favorite things to do are Nauyaca Falls(kid friendly horseback ride), whale watching/snorkel tour, surfing, boogie boarding, exploring the many beaches, going to Manuel Antonio for the day, and finding great places to eat dinner! Playa Dominicalito is a beautiful cove on the Pacific Ocean that is great for swimming, surfing, shelling or just relaxing. You can hire a chef to cook your meals at an additional cost. There is also outdoor dining under the palapa that seats four and 2 more seats outside at the counter with a pass-through window from the kitchen. Fully furnished, fully equipped unit with an open floor plan, 2 parking spots, washer and dryer in unit, maid service, gated community with 24 hour security, small electronic safe in unit, pool is great for kids and adults. 3 new homes under construction. Noisy till Sunday every day. Still enjoyed being here. Great management staff and truly friendly people here. I know the construction can be loud. It should be over soon! I’m glad you still enjoyed your stay. Hope to hear from you again next year. Pura Vida! Excellent beach views, wildlife all around, clean, cold air, pool, relaxation at its finest! This Villa was a delight to stay in! You have a view of Dominicalito beach from inside as well as from the outdoor patio. While there, I saw capuchin monkeys in the trees just past the road in front of the villa, toucans in the trees on the road coming up to the house, as well as iguanas and numerous geckos around the house (they stay discreetly away). The bedrooms and upstairs had good air conditioning, which is necessary if you are there during the day, but yet didn't have to constantly be on, they cooled the place quickly. The pool was great for cooling off after sunning, but there is also an outdoor shady area where I was able to do computer work while still partaking of the outdoors. Clean place, walking distance to the beach, and a short drive to Dominical, where you'll find good restaurants and some nightlife, along with surfing. Short drive to Manuel Antonio National Park and Beach. You can catch beautiful sunsets here every night! Will definitely return here and to this Villa! Stick around and get to learn the rythems of this area. Never dull, always mysterious and new experiences abound. The Villa has all you need and more. Brittany is very easy to communicate with and Tokia management are quick to respond. Can't praise Olmer the concierge enough. Have a rewarding time here surrounded by howlers, chattering monkeys and a large variety of gorgeous birds. Walk the trail and see the amazing Azure winged butterfly, fly right past you. I'm also happy to hear how helpful Olmer was and that things are running smoothly. 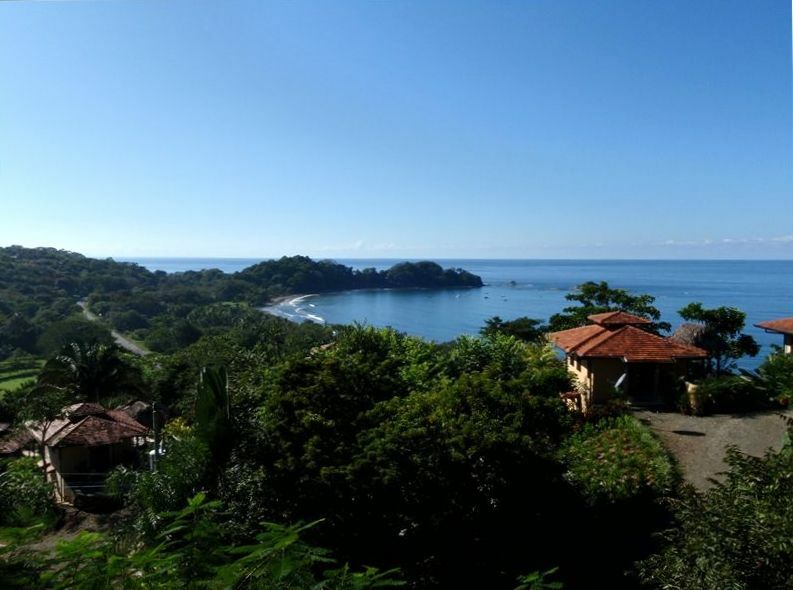 Property is a 5 minute drive from Dominical up a very steep gravel road (4WD required). House is comfortable and well-equipped with a nice view of the ocean and beach. View is slightly obstructed by trees, TV and dish washer didn’t work, but overall very positive stay. Great getaway for me and my kids! Stayed here with my kids and their friends (high school and college age) and loved it! It was the perfect location. Close to so many beaches and restaurants. The kids loved that there was a patio with a private pool to relax around and come back to after being down by the beach or out on an excursion. And, we took full advantage of the well equipped kitchen. We took turns cooking breakfast, and dinners. And, would hang out and play games at night. The view was gorgeous and I loved the bird watching in the morning while I was having my coffee. We saw lots of tucans and even saw howler monkeys right by the villa one afternoon. We loved it and will be back for more adventures in the near future!! What a View! Beatiful and all the amenities you need, including a pool! Explore the many beaches near us like Dominical, Dominicalito, Playa Hermosa, Playa Ballena (Ballena National Park),Playa Ventanas and many more! 10 minute drive to zip lining, 25 minute drive to Nauyaca Falls (this is a great horseback tour! Kid friendly! and includes breakfast and lunch). Manuel Antonio National Park and beaches are only 45 minutes away and a great place to visit for the day. The town of Dominical offers some great little restaurants and shopping and is known for great surfing for both beginners and pros. Also, there are nearby grocery stores, banks and gas stations. There are plenty of sports and activities around to keep you busy or you can just relax at the villa. Please inquire for best rental rates.